Seamless Transition, my... I thought they were working on getting this fixed?? Ha. Noah has been out of the Army more than 30 days and no one can tell him when his GI Bill will come through despite having filed all the necessary paper work and receiving "certification" before he left the Army!! The best answer he has gotten is "perhaps some time before year end." WTF?? AND while all his medical records were provided in advance and he has had the required evaluations from the VA (one happened within 7 days of his arrival but the other could not be accomplished for 30 days because they lack sufficient mental health evaluators! (arrrgggghhh) -- the evaluators then must send their findings to an outside agency that reviews it and prepares the NarSum (narrative summary) which is then forwarded back to the local VA (any time within 3 weeks to 3 MONTHS) who then reviews it and then submits it to the Regional VA Representative for finding and determination -- could be another 3 MONTHS! The Army education fund (an amount in addition to the GI Bill.) Four years ago when Noah signed his Army contract, he took a lesser cash bonus to get additional funds for college. At the time, the difference between the GI Bill and the level of benefits Noah contracted for was a little more than $17,000 -- the amount of his "bonus" college funds. Now, 4 years later, the GI Bill is worth 25% more, but no one seems to be able to tell him whether the "cap" in his contract is also increased by 25%. If it has not, then his "kicker" is now worth less than $11,000 in additional funds (over 36 benefit payments.) If he had served his country any longer, his "sign on bonus" would be worth about $0. College financial aid. Who cares how much money he made in the Army?? He's out of the Army and currently unemployed... as is his wife. They are looking for jobs but few employers are willing to work around a school schedule... or hire a pregnant woman... Perhaps Noah will find something closer to the holidays?? Same with unemployment: how long can it take you to figure out that he is unemployed, actively looking, and that he had earnings for the last four quarters? How can it take 8 WEEKS to answer those questions? All this has not helped Noah's stress level... he worries constantly about paying his bills... doesn't help that he observed this anniversary, this anniversary and has mentioned this anniversary and this one as well... he knows those dates better than family birthdays or wedding anniversaries (well, except his own...) All things considered, he is doing very, very well in school (trying to get over his astonishment that each week more than 1/2 the students in his classes don't even bother to do the homework or reading assignments...) Currently he is at the top of his classes... Interesting dichotomy... his instructors have been extremely supportive and congratulatory towards Noah's military service, most students are completely neutral but he has encountered a few that have been openly hostile or derogatory to his service. He has engaged one or two who seemed willing to listen to an informed opinion... but usually he just shakes his head and moves on... knowing that at this stage nothing he says can change their minds. 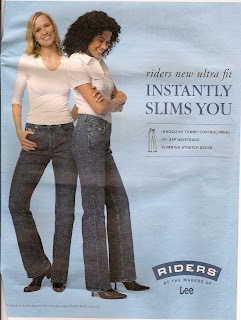 And, lastly... "Instantly Slims You"?? Just what the hell do women who are this thin need with an "innovative tummy control panel" and "slimming stretch denim"??? (I have had that same thought for years every time the Lands End catalogs arrives selling "Slenderizing Swimsuits" that feature women no larger than a size 4). I love Lee jeans and would probably like LE swimsuits, but I'm thoroughly insulted that the idiots who put out these ads actually think I (and other women) believe that putting these jeans or swim suits on my size 10 body will give me a size 1 look! If you want to sell "slimming" products, could you at least feature women that actually need slimming?? Just a reminder to register for the BlogWorld & New Media Expo... and for the Milblogging Track at the Blog World Expo in Las Vegas starting November 8-9. Open to the public (but y'all have to register). Hope to see as many of you there as can fit it into your hectic schedules. Oh yes, the hoop jumping. Isn't it lovely? It's a job unto itself! I hope Noah and his wife get all of the benefits figured out. I am sure that all of this really does have to be so stressful on such a young couple. When is the baby due, if you don't mind my asking? Also, is there somewhere we can send a gift (or an email where I can send a gift certificate for the baby)? :) I would love to give a gift if that would be OK! The "Paper Monster" of Big Govt can be a frustration. My daughter continues to do well at school, as Noah is. Along the way she has discovered a world of "closet conservatives or at least grateful Americans" at Leftard University. She keeps getting scholarship some professor she never met applied for on her behalf, part time jobs and internships etc. (Not that she isn't beyond fully qualified). Plenty of folks on College Campuses want to give War Vets the nod in favor of pampered students who complaign about having to do 2 hours homework. To you and I our war vets are the age they are...put them into a room of other 20 somethings and the differences are striking. Noahs professors see it plain as day and come time for internships for "proper" jobs..and corporate recruiting so will the employers. Noah finds it strange that "half the students don't do their homework"...college professors don't find that strange..and employers don't find it strange that "half the workers don't do their jobs"